Giorgio de Chirico was a surrealist Greek-Italian painter, who founded the artistic movement of scuola metafisica and who spent part of his life in Florence. 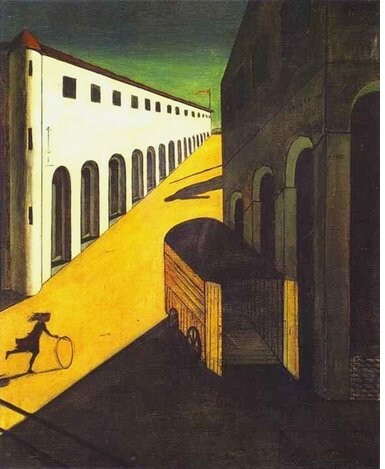 This town is, in fact, very important in his painting as we can find it in several of his works, like the first of “Metaphysical Town Square” series called The Enigma of Autumn Afternoon which was painted after a revelation De Chirico felt in Piazza Santa Croce. His paintings are expression of an inner reality, which sometimes the artist can see thanks to the revelations; what he represents in his works is a special moment that, being painted, can be relived in time. His dreaming landscapes evoke a haunted, brooding mood, often representing squares, towers, which give to the whatcher an alienating sensation. He also lived in Paris, where he had many connection with the surrealist poet Guillaume Apollinaire. Discover your personal painting style and improve it with the drawing and painting courses here at Istituto Galilei!